Monday 1 April 2019: Limerick GAA has capped yesterday’s thrilling National League final by signing a new sponsorship deal for its county senior hurling championship with Bon Secours Hospital Limerick at Barringtons. 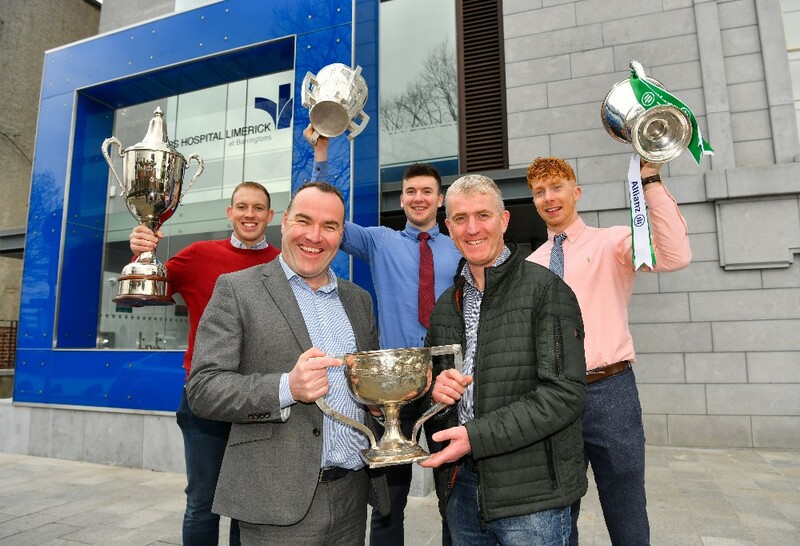 The three-year partnership will see Limerick’s oldest hospital deepen its relationship with Limerick GAA as it puts its support behind one of the most competitive and exciting county senior hurling club championships in the country. The sponsorship - the blue riband competition will be known as the Bon Secours Hospital Limerick Senior Hurling Championship - was announced today at Bon Secours Hospital Limerick at Barringtons in the company of the Dr. Croke Cup claimed yesterday in the clash with Waterford. Today’s event was attended by Limerick manager John Kiely, players Declan Hannon, Cian Lynch and Shane Dowling; Chairman John Cregan and Secretary Mike O’Riordan as well as Bon Secours Hospital Limerick at Barringtons Manager Jason Kenny. The partnership comes on top of the existing relationship between the two that sees the hospital provide quick access to Limerick senior players for MRI and Xrays to ensure quick and exact injury diagnosis and, in turn, allows players to embark immediately on their recovery programme. The club championship sponsorship agreement kicks in for the commencement of the first round of the ‘Bon Secours Hospital Limerick Senior Hurling Championship’ next weekend. Speaking at today’s announcement, Limerick manager John Kiely said; “It’s a great time for Limerick hurling but all that’s happened over the last year or so would not have happened were it not for our clubs. The success at county level is making our club championships hugely competitive and it’s great to get this support for it from our local Bon Secours hospital. Said Limerick GAA Chairman John Cregan: “Yesterday was a great day on the pitch for us and today is a great day off the pitch. It all starts with the club. Nothing happens without the club and we’re delighted to be getting this boost so close the start of this year’s championship. Said Jason Kenny, Hospital Manager: “We’re delighted to be sponsoring the senior club championship. It’s a top club competition and we already have a great relationship with many of the players as they come in and out to for injury scans. They’re an absolute pleasure to deal with and we are just delighted to be able to bring our expertise here to bear.